“Analytics is the primary enabler to derive truth and meaning from data that drives the business growth” – Hugo Moreno via Forbes. Companies rely on data more than ever before, as almost all information is completely digitized. 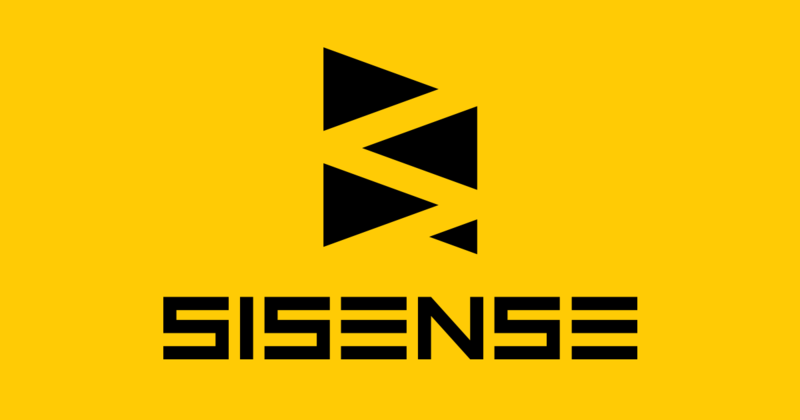 Business intelligence software makes sense of the modern data landscape. The best BI systems offer features that analyze and report data for streamlined presentation. Some of the top tools in the industry are Tableau, QlikView and Microsoft Power BI. If you’re evaluating Tableau vs QlikView vs Microsoft Power BI, read on. We highlight the key pros and cons of each and include a comprehensive business intelligence tools leaderboard showing how each stacks up across key business and functional requirements. Tableau leads the industry in data visualization software. The company is investing heavily in advanced data federated, clustering, segmentation and more powerful analytics functions. The user-friendly interface allows non-technical users to quickly and easily create customized dashboards to provide insight into a broad spectrum of business information. 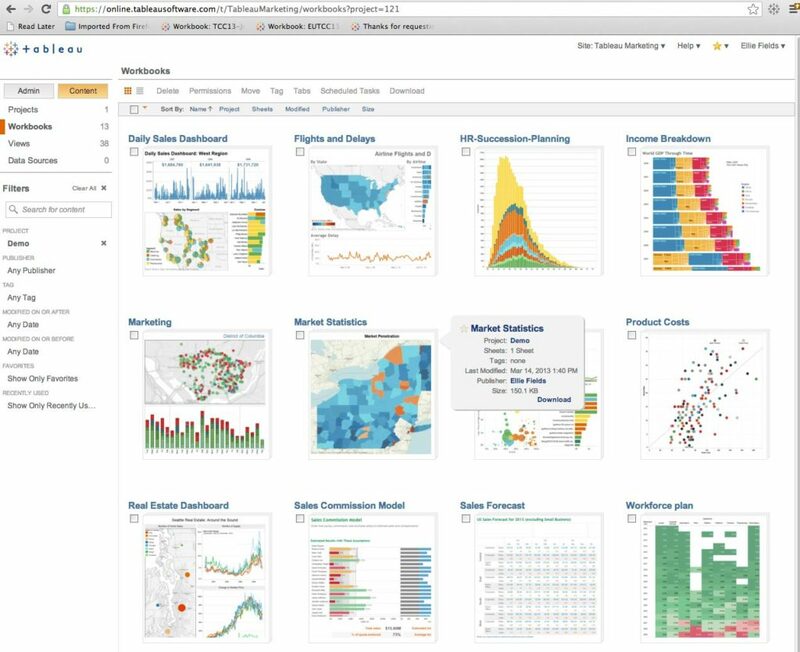 The drag-and-drop capabilities of the solution, paired with its extensive data source connections, make Tableau a front-runner in the realm of data visualizations. Along with standard report creation features — visualization templates, customizable views, configurable graphics — QlikView’s data visualizations factor in real-time, interactive analysis as reports are made. When the system is in use, all relevant visualizations and data sets are displayed for quick reference. Qlik’s product strengths include an in-memory engine capable of visualizing patterns and producing associative analytics that isn’t achievable using SQL alone. The in-memory engine is scalable enough to integrate with many different types of data sources, creating a unified dashboard showing analytics, metrics and key performance indicators (KPIs) of interest. Microsoft Power BI hosts one of the most user-friendly data visualization tools in the business intelligence market. The drag-and-drop functionality of the software, along with access to over 85 data visualization applications, provides an uncomplicated experience that results in visually appealing and informative reports. Microsoft Power BI utilizes many of the same functions available in Excel, so users with experience in the Office staple will be able to adapt to this visualization tool. Creating reports through Microsoft Power BI results in data portraits that can be shared across teams and accessed on any device. Tableau surpasses its competitors in the category of data visualization. With its intuitive interface, customizable presentation options and real-time analytics, Tableau provides an all-inclusive and user-friendly data visualization experience. Tableau is committed to providing a tool to enterprises that reflects their urgent analytics requirements. This is evident in the enhancements to data federation, streamlined interfaces, advanced analytics and improvements to mobile exploration and authoring. Tableau reflects the needs of organizations that want to move beyond the data visualization aspects of their applications and get more advanced analytics work done. Support for more complex data federation workflows, making data mashups more reusable and making improvements to mobile app development to support all mobile screen sizes is available in the software. Unlimited data sources can be combined in QlikView without the need for initial preparation. Qlik relies on sophisticated analytics that enables data discovery using an in-memory engine to analyze data for patterns not visible via SQL data structures or queries. The system’s Social Media Analytics function analyzes data from social channels including Twitter, Foursquare and Disqus, and QlikMaps provides location analytics. QlikView promises “speed of thought” automatic analysis and insights as users interact with their data. The software’s guided analytics features provide a path through data and point users in the direction of insights, helping employees of all skill levels perform analytics. As stated in the aforementioned Forbes article, “Data analytics skills gaps persist across the enterprise, as 27 percent of analytics professionals surveyed cite this skills gap as a major impediment in their data initiatives.” QlikView’s guided analytics help with some of these skill gaps. The accessibility of a familiar Microsoft platform ensures an easy-to-learn, low-cost Power BI experience. The analytics interface of Power BI closely resembles Excel, assuring recognizable functionality. Microsoft Power BI creates complex data analyses that include premise-based data sources and integration points. Data prep, data discovery and interactive dashboards are all included in the Power BI Suite and Power BI Desktop. Measurement, organizational and predictive features allow for simple data management and trend interpretation. Besides the tools for standard data analysis, Power BI hosts integration with location-based data programs such as SQL Server Geospatial, BING and Esri ArcGIS. In the comparison of QlikView vs. Tableau and Microsoft Power BI, QlikVIew has the best analytic features. The software boasts a flexible analytics platform that allows businesses to customize guided analytics applications that update during use. An analytic dashboard from QlikView. Tableau can connect to OLAP cubes as a means of exploring layers of data at the deepest level. Drill-down features, along with filtering abilities and time-series auto-generation, serve as the tools needed to dive into these multidimensional datasets and access the insights they provide. Access to online analytical processing through QlikView provides encapsulated data views. With this software, users can analyze the depths of OLAP data and relate insights back to their own findings. The QlikView OLAP Connector extracts data from large databases and data exploration features like drill-down capabilities provide access to the deepest levels of data cubes. Diverse databases provide a full view of analyses, viewing the layers of data cubes through multiple perspectives. Microsoft Power BI connects to OLAP cubes via SQL servers for multidimensional data analysis, information extraction, pattern observation and data mining. Predictive analytics features forecast potential future trends. The software provides a list of data measures to display in the report. The selected dimensions are featured alongside visualization options during report creation. As a typical OLAP platform, Power BI includes drill-down and other data exploration tools. Tableau, QlikView and Microsoft Power BI share OLAP capability; the programs all feature standard OLAP functionality on the same level. Tableau has included support for publishing analytics content on a variety of publishing platforms. Options available for report formatting include PDFs, spreadsheets, images and crosstabs. Users can view all stages of a report’s creation with a feature that archives all past versions to be viewed later. QlikView users can convert reports into XLS, HTML, XML, QVX and PDF formats — with the help of a PDF Report Distribution add-on. The software supports QlikView script files (qvw) to allow for simplified tracking and comparison of binary files. QlikView’s version control tool can track fluctuations in data. Reports generated in Microsoft Power BI can be exported as PDF, TIFF, HTML and Microsoft Office files. Power BI files include desktop files (pbix) and templates (pbit). With Microsoft as the engine behind Power BI, report exporting and document access is simple. However, Power BI does not directly support version control. These three business intelligence solutions are equivalent in the category of document management. All of the programs are able to convert reports into multiple formats with ease. Tableau’s consulting services provide a resource for assistance in data analysis interpretation and decision making. Fraud detection tools embedded in the software serve as a robust security measure. Included as part of this focus on broader analytics support are improvements to self-service data preparation, more control over data governance and metadata management, and additions to embedded advanced analytics. QlikView’s financial services and banking tools provide accurate knowledge and analysis that leads to informed decision making, while security measures minimize fraud risk. Necessary regulations and policies are monitored with QlikView Governance Dashboard compliance tools. 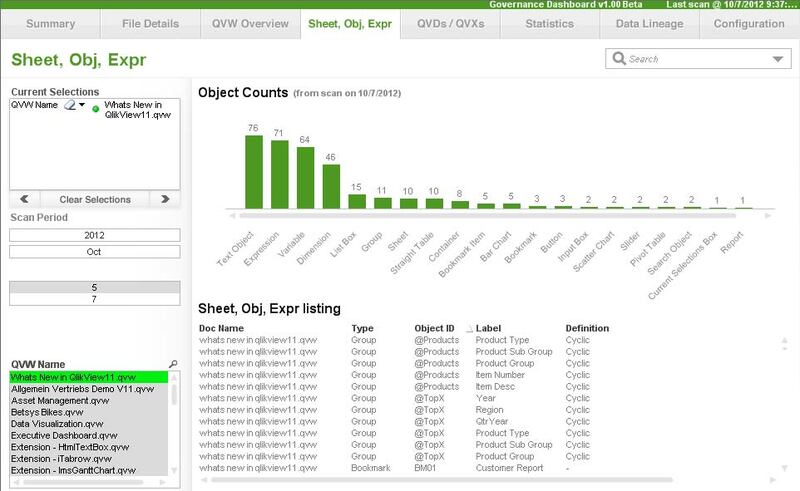 QlikView Logs provide data on CPU, RAM, Disk, Process, User, Document and Reload information. The vast range of QlikView’s BI tools can be learned quickly using their online tutorials and learning systems. The product comes bundled with numerous tutorials, how-to guides and other self-help resources, as well as a team of QlikView experts. Qlik’s consultants can assist with each step of learning the system’s capabilities, from beginner lessons to pulling data insights and creating applications. Microsoft Power BI can be used as a financial analysis tool with fraud protection, compliance monitoring and additional security features. Regulatory compliance is managed through a data residency model that focuses on compliance requirements, including those of the Free Trade Association and European Union. Analysis functions display trends and offer insights through consulting services. Power BI consultants give users a support system for all inquiries concerning the software’s functions. Not only serving as a guide to the software’s functions, consulting services through Microsoft Power BI offer insight into the analyses provided by the system. Additional services include financial analytics, fraud prevention and security measures, and compliance monitoring. Microsoft has also collaborated with companies like Dell, Avanade Inc. and Bismart for the Power BI partner program — a team of over 300 organizations bringing solutions and expertise to users. And with the Power BI partner search engine, businesses can use filters to find the right solution for their location, industry and company size. When considering Power BI vs Tableau or Power BI vs QlikView, the partner companies of Microsoft Power BI place the program’s decision services above the others. Power BI partners provide an extensive source of know-how unmatched by competitors. Qlik has one of the most advanced Application Programming Interface (API) command sets in the analytics industry and has continually been improving its functionality over the last several years. QlikView’s API provides seamless integration with other tools and the data housed within them. With many enterprises requesting API support, Qlik has also provided APIs to control functions previously accessible only through the user interface. The result has been rapid adoption of the Qlik Analytics Platform (QAP), which is being used today by developers to embed analytics queries into reporting and analytics apps. QlikView has the ability to extract data from standard open database connectivity (ODBC) and OLE connections and non-standard, unstructured sources like text files and XML files. Integration with web services, security tools, legacy systems and metadata is offered through QlikView as well. The software advertises coordination with Excel, Salesforce, SAP Netweaver and Microsoft SharePoint. Microsoft Power BI possesses the advantage of Microsoft’s familiarity and connections to assorted applications. Users of Microsoft Power BI can mine data from programs such as Microsoft Excel, Google Analytics, MySQL, Oracle, Salesforce, MailChimp, Facebook and Zendesk, with new data sources added every month. The Microsoft foundation of this analytic tool ensures a smooth meshing of Power BI with the existing work base of a business. One of the more innovative features of Microsoft Power BI is the ability to use browser- and desktop-based authoring with apps and platforms that are both on-premise and in the cloud. This hybrid integration strategy is based on the Microsoft Azure Cloud APIs. The Microsoft backing of the Power BI platform ensures simple integration with a number of external applications. Nearly every program that works with Microsoft can integrate with Power BI, offering an expansive library of possible collaboration options. Tableau can connect to nearly any data repository, ranging from MS Excel to Hadoop clusters. The program opens up data source integration to a broad range of relational databases, Hadoop distributions and NoSQL.  Additionally, support for IBM SPSS, SAS and open source R data files is included in the product. There is also a Web Connector that supports integration to Marketo, SQL and other enterprise systems. QlikView can pull data from many sources to ensure a complete portrait of information and its relationships. A benefit of QlikView is that it can plug into almost any data source, making it the most versatile of the modern intelligence tool offerings. The software uses its Qlik Connectors application to pull data from various sources. The Qlik DataMarket is a resource that offers users a place to acquire external data sources. The extensive databases provided by the Qlik DataMarket open businesses to new tools for managing data. In conjunction with other Microsoft offerings, including Azure, SQL Server Analysis, real-time data streaming and R-analytics, Power BI provides a broad analytics landscape. Connect Power BI to in-house data sources or external sources like Hadoop, Azure HDInsight and Spark for a full range of data access. Open database connectivity integration provides access to big data sources. Users can visualize, analyze, report and share data pulled from ODBC sources. 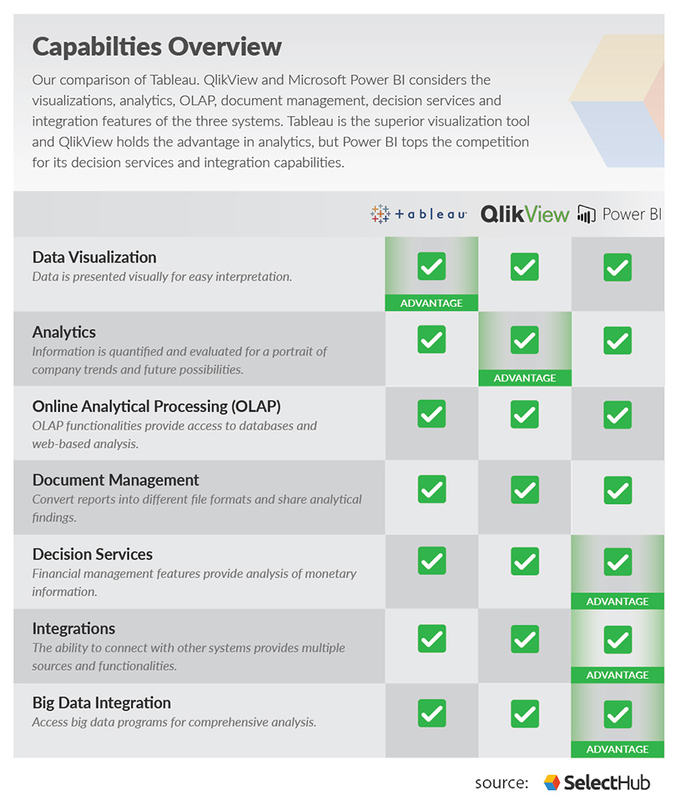 The simplicity of Microsoft Power BI’s big data integrations places the solution above Tableau and QlikView. 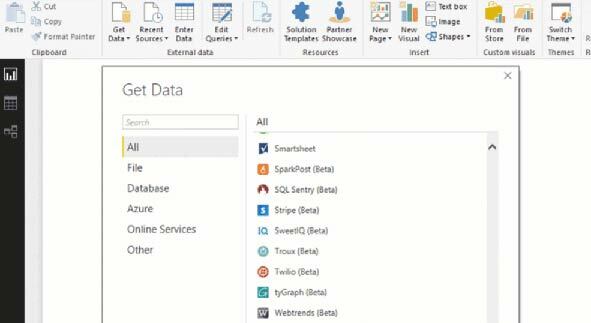 Power BI presents databases in a menu view where users can simply select their data source of choice, connect to the data and begin the process of analysis and reporting. If big data integration is one of your key business intelligence requirements, consider this when evaluating Tableau vs Power BI or Power BI vs QlikView. A view of Microsoft Power BI’s data connectors. Tableau, QlikView and Power BI are all solid BI tools. Which one is the best fit for your company depends on your analysis needs. If connecting to existing internal databases, data warehouses and other data sources is critical to your operations, you must individually analyze these solutions against those requirements and configurations. If visualizations are your core focus, Tableau is far and away the best answer. There is a reason the company and product are consistently top-ranked in intelligence visualizations. QlikView is highly adaptable and provides wide-ranging deep analytics. It also provides integration with Deltek products, so if you use Deltek for time and expense or earned value management (EVM) reporting, QlikView is a natural choice. Overall, QlikView also continues to have one of the industry’s highest customer satisfaction ratings. Microsoft’s Power BI is inexpensive and plugs in seamlessly with MS Office. It is a solid option if you need quick access to specific analytics or intensive reporting (and have personnel who are skilled in MS-based data queries). Microsoft Power BI is the only one of these three data visualization and analytics apps that have extensive R and big data-related integrations, ensuring this apps’ scalability for larger projects. Overall, Microsoft Power BI emerges as the most comprehensive solution among these three tools. Microsoft provides integration abilities that are simply unmatched by competitors, resulting in one of the most user-friendly, data-connected business intelligence systems available. Does your business use Tableau, QlikView or Microsoft Power BI? What is your experience with these tools, and business intelligence software in general? Tell us in the comments! Much thanks! This a astounding web site!. Currently Iam working as Congnos BI developer. I wanna change my career . Can any one suggest me Which one is best in the market now Tableau/Qlikview/MSBI/IBM Cognos BI. I would suggest you to go with QlikView, because it is becoming very popular nowadays, but Tableau is also good choice considering complexity and versatility of this tool. Hope it helps a little bit. Though I cannot confirm a definitive answer as to “which is best” I have a friend who was a very senior Cognos consultant that recently moved to Tableau and my impression is that he’s very happy to have made the move! I firmly believe that the future will be dominated by Tableau, Qlikview or PowerBI; Tableau has the market share and ease of use, PowerBI has the advantage of the native Microsoft integration…. Currently I am working as Business analyst . I want to change my career . Can any one suggest me Which one is best in the market now Tableau/Qlikview/Powe BI. Given your background in Cognos BI, you can easily learn any of the 3-4 tools you have asked about especially Qlikview and MS Power BI. But do know that learning new BI tools does not maketh a “new career” for a BI developer, it’s called “keeping up”. None. Sorry to be blunt. The idea of pure visualization and analytics tools without feedback loops into processes (So called Insight only tools) is just not enough. Most application based analytics are now embedded anyway (especially in the cloud). So process improvement (insight to action), corporate steering, value driver trees, rules engine, machine learning, big data learn,business partner integration, learn and burn scenarios all find very little value in a stand alone analytics tool. Time to move into ML, Advanced Statistics and most importantly Data streaming and data quality (all 5 dimensions). The above vendors all have little to add until they can integrate into the “action part” of insight to action. Most are being ripped out anyway due to lack of Governance and high cost. Expect more from your data asset than some pretty story boards and graphs. Think what you need to move from Insight to Action: Alignment, Context, Relevance, Specificity, Change, Monitoring/Clarity of impact. None is available in the tools mentioned here as far as i can tell. All they do is break the key paradigm for digital: Do not replicate data if at all possible, and never break the link to live data. Chris, thank you for the insightful reply. Are there tools you’d recommended that meet the criteria you’ve outline? Hi Miguel. We double checked this information for you and updated the article. Thank you for your comment! i honestly don’t know what the author means about Microsoft have more integration abilities than Tableau.. it doesn’t – that’s the reason why i don’t choose Microsoft – because it’s so microsoft heavy. first of all you need to run the desktop on windows, 2nd if you need to publish the report to the server to share with others, you’ll need the ability to refresh the data.. the only way you can do it is through gateway – https://docs.microsoft.com/en-us/power-bi/service-gateway-onprem . That only runs on windows! Firstly, apologies for the delayed response. We had our analyst team look into this to make sure you got the most up-to-date version of the information you needed. We found that Microsoft Power BI offers support for 100+ data connectors including SAP HANA, Hadoop, Google BigQuery, Google Analytics and more. It’s well integrated with Microsoft’s portfolio products, including its Azure cloud platform. It also offers more than 180 custom connectors to build workflows, apps, and integrations with Azure Logic Apps, Microsoft Flow, and PowerApps. Tableau supports 70+ connectors but connects with many more varieties of data sources as compared to MS Power BI. Hopefully that provides some insight for you!